Cision’s media database gives you access to 1.6 million media contacts, including 300,000 digital influencers. 1. Build Lists: create lists of contacts, outlets and opportunities based on topic, coverage, market, media type & more. 2. Find Media Influencers: use the exclusive Cision Influence Rating to help determine an influencers’ impact across all media. 3. 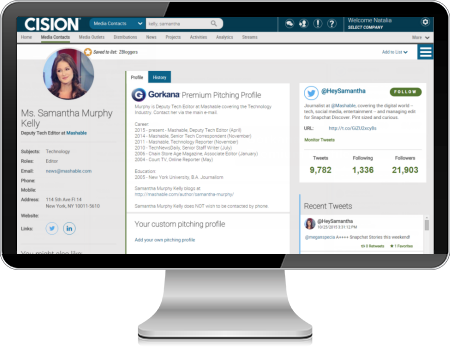 View Detailed Profiles: understand preferred contact methods, gain valuable pitching tips, and access social profiles. 4. Seamless Integration: our distribution and monitoring tools make for a fast, efficient campaign deployment and analysis process.